A great collection with BIG pictures of adorable plush Yorkies just for you. 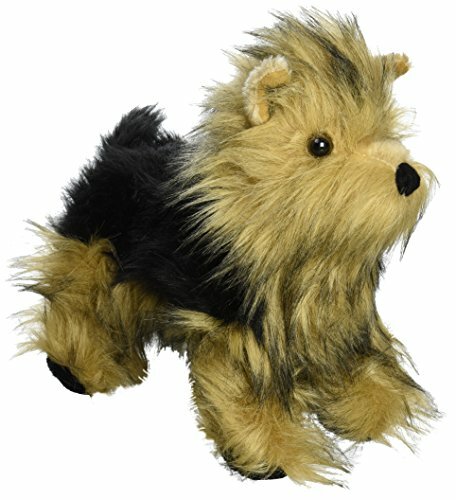 Who can resist the cuteness of a Yorkshire Terrier, each introduced with a bit of story telling. 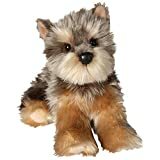 Plush Yorkshire Terrier dog toys are nice for children who are too young for a real pet, or adults who love collecting plush animals and stuffed toys. As the former owner of a sweet Yorkshire Terrier, and one who hopes to own another one day, I know how dear these dogs are to their owners, and how much we enjoy receiving little things that remind us of our dogs. This is a place to look at and maybe buy cute Yorkie stuffed animals. We added videos of Yorkies doing tricks just for fun, and share about the dogs in story form. 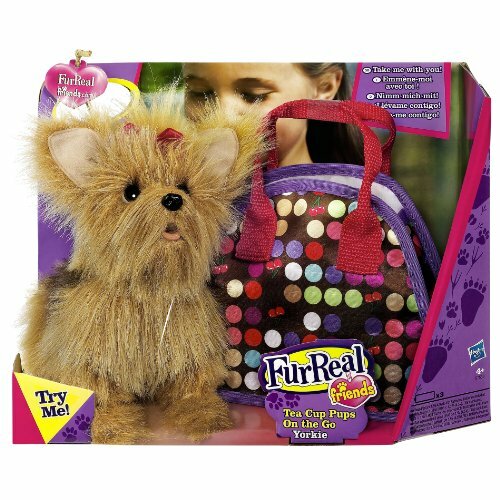 Have fun visiting, let us know whether you have a "real" or plush Yorkie in our short poll, and if you have a moment, sign our guest book. crossed the Rainbow Bridge in August of 2013. 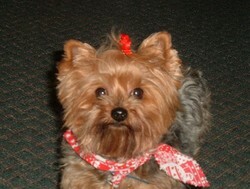 All Yorkie pages I write are done in her memory. I'd like to tell you about the sweet little dogs on this page, but in an entertaining way. Enjoy the stories with information about each dog within each story so you know what your getting should you chose to buy one. If you're in a real hurry, all you have to do is click the image, or the button or title under each image. If I'm Douglas, why do we need a Doug? Douglas was a well kept little Yorkie. His coloring was so nice that he looked almost real. His coat of fur was VERY soft and evenly cut in what you might call a puppy cut. He stood about 12" tall, quite proud of himself and his looks. "People will surely want to buy me, just look at me!" he thought. Then one day another Yorkshire Terrier became available on the market. He...or she...was not nearly as polished in appearance. 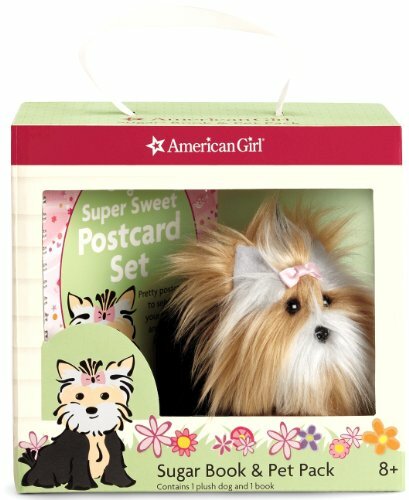 In fact it was hard to know whether it was a boy or girl dog because it was called a "Melissa and Doug" dog. Douglas was confused and a bit jealous. Why was there a need for another dog named Doug when there was already a Douglas? Douglas decided to think of the new dog as Melissa to save himself much confusion. He told everyone that Melissa was a little smaller than he was, measuring 5 x 10.4 x 12 inches and weighed 11.2 ounces, and that she really needed a good grooming to straighten out that hair. Douglas didn't realize that some people like their dogs to look a little scruffy. Eventually Douglas and Melissa (who really was Doug but didn't want to disappoint Douglas so kept it a secret) were purchased by the same family and became great friends. 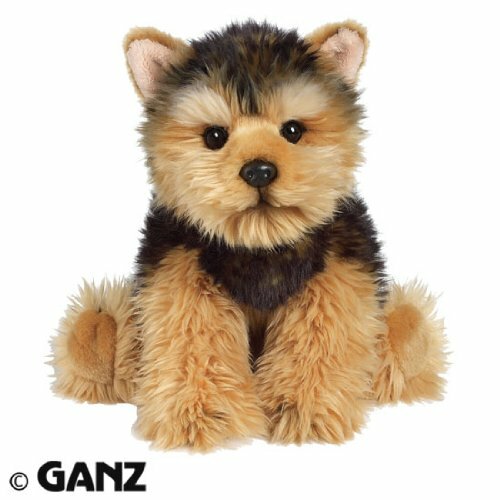 Ganz was sitting in the store one day, the place where all plush fur babies wait for someone to come buy them and love them. He thought to himself, "why would anyone buy me, I can't do anything". Days went by, and he sat and sat, then one day, along came a little girl and her big brother and saw him sitting on the shelf. 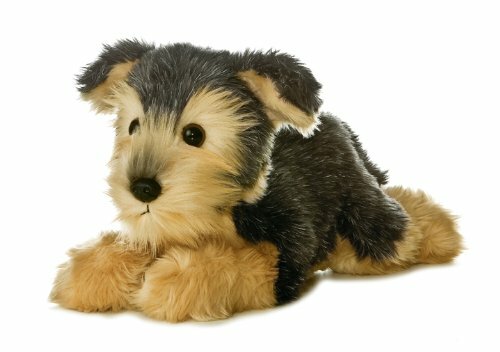 The boy told his sister "Hey, that's a plush Yorkie! I was just watching videos of Yorkies doing tricks!" He had his smartphone and found a couple of the videos (the ones you can view below) to show his sister. As he held the phone for his sister to look at the dogs, Ganz was able to see the screen if he really tried, and watched in dismay as the Yorkies did their tricks, realizing there was no way he could ever do anything like that. But it didn't matter to the little girl, she picked Ganz up, and ran to her mother, asking if she could have Ganz. Mom fell in love with Ganz too, it was then that she discovered something Ganz didn't even know himself, he came with a code to activate an online version of himself! There was something special about Ganz after all, a little Yorkie that measured 7 x 6 x 10 inches, and he went home with his new family that day, even though he could not do tricks like the Yorkies in the video. The Freeing of the Boxed In Yorkies - Dogs are Meant to be Free! Sugar Book and FurReal did not care that they were cute. FurReal didn't care that he came with a pet carrier and could make sounds and move his head. Sugar Book didn't care that she came with postcards and stickers to decorate the postcards with all kinds of sugary treats, or that she came with a pull-out mini poster. All that Sugar and FurReal cared about was getting out of the boxes they were in! They felt so trapped! 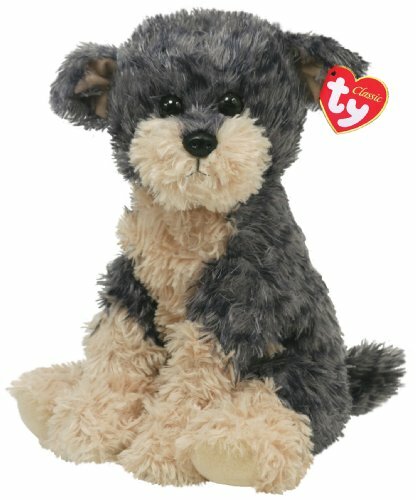 Other stuffed dogs were sitting unconfined by boxes on the shelf, but not Sugar Book and FurReal. Then the happy day came when one, and then the other, was purchased, and released from their boxes, and were cuddled and loved by their new young owners just as little Yorkies should be. Can You Start a Story for the Two Yorkies Above? Choose one and give us the first sentence or two that you would use to start your story. How do you tell the best of the breed apart from all the rest? Why, it's the "Y" for Yorkie in the "TY" heart that makes us the best of all the rest! Be a clapper for this Yapper! "I'd been a very good Aurora. I'd spent weeks pretending but now it was time for the truth to out." Whitey was unique in the world of Yorkies, with fur that was the whitest white that you had ever seen. There was not a brown or black bit of fur to be found on this dog. The fur was long, so his owners weren't afraid to let Whitey play outside on cold days. One cold winter day, it had snowed the night before. 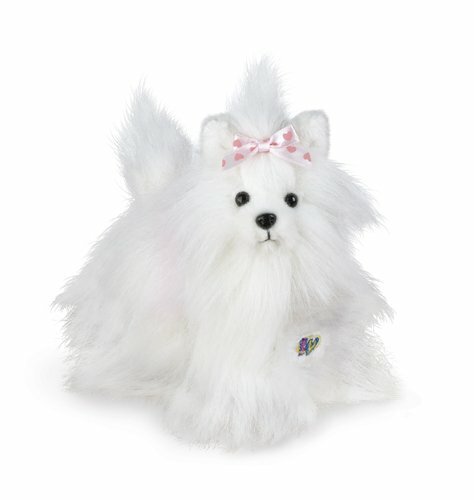 When the owners were busy with the virtual version of their plush pet who has a Webkinz pet with a code that allowed the owners to join a virtual world and build a collection of virtual pets, Whitey was able to sneak outside. Whitey had a wonderful time frolicking in the snow, but when the owners were looking for Whitey, there was nothing to be seen! Whitey was lost in the whiteness of the snow. Finally after much fun in the snow, Whitey came in, and the children decided that they would include Whitey when they went to look at their virtual Webkinz pets online from then on, especially when there had been a lot of snow. Kaelin was small in size for a Yorkie, just 6" tall, but this didn't stop him from challenging 11" tall Miyoni. Both sported handsome mustaches, but little Kaelin thought his was the best. This lead to a competition between the two, and so they needed a pretty girl to sort things out between them. They chose the "Lady in Pink" (pictured below) to decide which mustache was the most handsome. 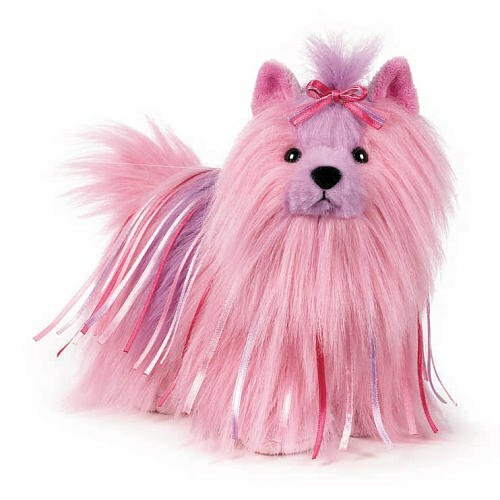 They made their decision based upon the stylish appearance of this female Yorkie, her unusual pink coloring, and the fact that she was known to be quite the diva! They knew she would be direct and honest with them. What they didn't expect was that she would become completely distracted by the red bows on their heads. "Why are you worried about mustaches when both of you are wearing red bows? Boys don't wear bows." Miyoni felt about as small as Kaelin after hearing this, and Kaelin didn't feel much better. They knew when the bows were put on their heads that it just wasn't quite right, so both had worked real hard on their mustaches to bring out their masculine side. Both Kaelin and Miyoni were humbled, and put in their place, and from that day on, admired each other's mustaches, realizing both had a good reason for wearing them in the first place. 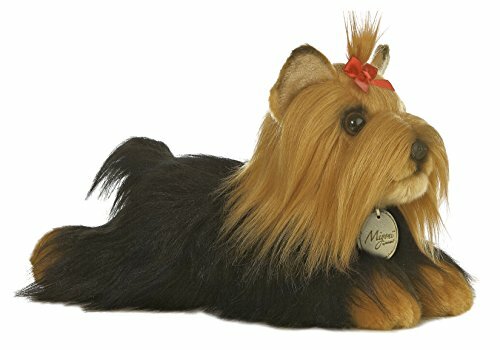 Do You Own a Yorkshire Terrier? I have 1 or more of Both! I hope you've found our page entertaining. Please ask any questions you have and I'll do my best to help you. Comments are moderated. Thank you @Sylvestermouse I have never written little stories like that...don't know what came over me but it sure was fun! They are all so adorable! I love all of the little stories you wrote about them. 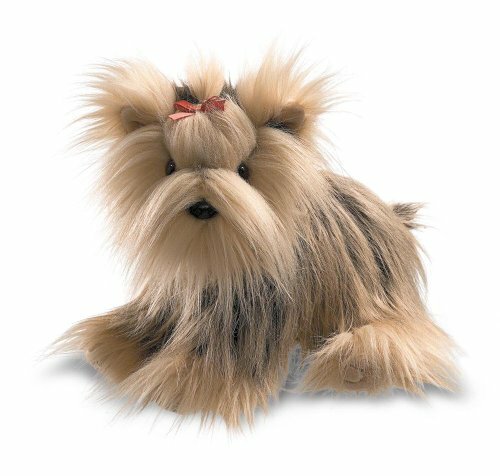 Oh, what fun your storytelling for the Yorkie plush animals! I say we release them all from their boxes! Jealous! I'm so determined to have chickens someday. They're so cute and although I'm not a vegetarian, I saw a video about how chickens are practically tortured to produce eggs for big stores and supermarkets. I'd much rather raise my own chickens humanely and get eggs that way. Anyway, I'm way off track. But yes I agree, Yorkies are precious. @KaitlynDeMetro Wow, I just finished publishing and editing this page probably while you were commenting on it...lol! You are fast. Isn't that the sweetest thing, how bonded your dog became to a kitten. My daughter lets her 2 dogs, 2 cats, and 4 chickens...yes, I said chickens...all mingle together and they all get along! I would be too concerned about something happening, but she is more relaxed than I am. I have seen a yorkie maltese mix and they are precious. Thanks for visiting!